The “Yellow Vests” protests now challenging President Emmanuel Macron have exposed a widening hole in the center of French politics—created by Macron himself. It was Macron whose election in May 2017 all but obliterated the two establishment parties that had run France for 30 years. His own political movement had been launched less than a year before and his closest opponent for the presidency was from the far-right. By positioning himself as a reformer, Macron, 40, had hoped to establish a centrist consensus. Instead, with his popularity now at record lows and his Republic on the Move far from becoming a real political party, the president faces widespread opposition across the country, especially outside major cities. The “Yellow Vests”—“gilets jaunes” in French—reflect France’s frustration at a young leader whose agenda is perceived as favoring the rich and whose manner is regarded as aloof and arrogant. The grassroots movement, organized through social media and without real leadership, has led to two weeks of sporadic and mostly peaceful blockades of roads, fuel depots and warehouses. A protest Saturday in Paris exploded into violence that left over 100 injured and more than 400 arrested, as well as burned cars and looted stores in the heart of the capital. Named after the colored vests motorists must keep in their cars for emergencies, the campaign began as a protest against higher gasoline taxes to reduce emissions. It’s now expanded to other demands and has the support of three-quarters of the French public, polls show. 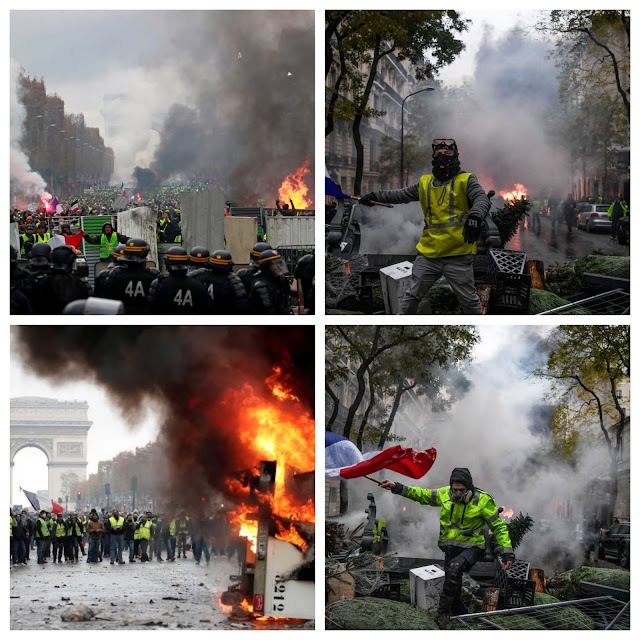 “We are talking about cost of living and Macron is talking ecology,” said Joffre Denis, a 33-year old fireman who had come 125 miles from his home in the north of France to Paris, wearing a yellow vest at Saturday’s protest. “His solution for people who can’t afford food by the end of the month is to buy solar panels and electric cars.” Denis said that after 17 years on the job, he takes home 2,300 euros ($2,600) a month. As he spoke, standing on Avenue Marceau near the Arc de Triomphe, a line of riot police blocked access to the monument and tear gas was being fired on the other side of the circle. Denis said he condemned the violence. The movement itself is split between moderates who want to create a structure to negotiate with the government, and radicals who reject any form of leadership. An attempt by eight local spokespeople to create a national committee was disbanded after four days when they received threats. Only two of the eight invited leaders showed up for a planned meeting Friday with Prime Minister Edouard Philippe. The Yellow Vests at this stage aren’t likely to evolve into a political party like Italy’s Five Star Movement because they lack a charismatic leader, said Sylvain Boulouque, a historian who has written books about extremist parties. But there’s no way their votes will go to the center-right Republicans or the center-left Socialists, the main establishment parties. Neither party has recovered from being marginalized in the 2017 election, the second round of which pitted Macron against far-right leader Marine Le Pen. Most Yellow Vests supporters will split their votes between Le Pen’s National Rally and Jean-Luc Melenchon’s far-left France Unbowed, Boulouque said. Together, they received 41 percent of the vote in the first round of presidential voting in 2017. Although polls show the French public overwhelmingly supports the demands of the Yellow Vests, respondents don't see anyone else handling the situation better than Macron. An Ifop poll released Nov. 22, after the Yellow Vests’ first major strike, said 26 percent thought Le Pen would do better and 21 percent chose Melenchon. The center-right establishment party was chosen by only 15 percent and 6 percent went for the Socialists—who controlled both the presidency and the parliament until Macron arrived. That hasn’t kept other parties from jumping onto the Yellow Vests’ bandwagon. “All this violence is the fault of the government refusing to listen, of its arrogance, its disdain for common people,” Le Pen said on BFM TV Saturday. Recent polls have shown that her anti-immigrant, anti-European Union party will get the most French votes in next May’s European Parliament elections. Macron himself was in Argentina Saturday attending a G-20 summit. He returned Sunday and went straight to visit the damage to the Arc de Triomphe before holding an emergency meeting with top ministers. There was no statement after the 90-minute session. In a speech Nov. 27 he outlined the need to maintain the gasoline taxes as part of efforts to wean France off fossil fuels, but offered “town hall-style” debates about the country’s environmental policies and vague promises of reviewing future tax increases. Macron doesn’t face national elections until 2022 and has prided himself on sticking to his policies no matter how low he goes in the polls, saying the unpopular tax and labor law reforms he pushed through early in his term will eventually pay off in higher growth and job creation. He now faces two unpalatable choices: breaking his promises not to back down on his program or further deepening his unpopularity.